Counseling notes including information on the availability of low-income legal clinics to tax resisters, new estimates of the size of the underground economy and of the number of non-income-tax-paying households, and the IRS’s use of “ghost returns” when they battle non-filers. 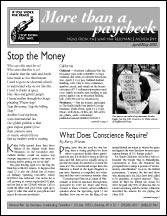 International news from the Conscience Canada group of war tax resisters. Ideas & Actions including a radio show sponsorship by a local war tax resistance group, an anti-census action in Britain, and Elizabeth Boardman’s evocation of John Woolman. While in the area, Ellsberg said he planned to visit with Randy Kehler, an old friend and tax resister whose refusal to pay taxes led to a much-publicized 1991 confrontation with federal authorities that forced Kehler and his wife, Betsy Corner, from their Colrain home. Ellsberg said he first heard Kehler speak at an anti-war, draft resisters event in 1969 when Kehler talked about being willing to go prison rather than go to war. It was that moment, Ellsberg said, that he realized he would have to act on his own already strong feelings about the waste and folly of Vietnam.